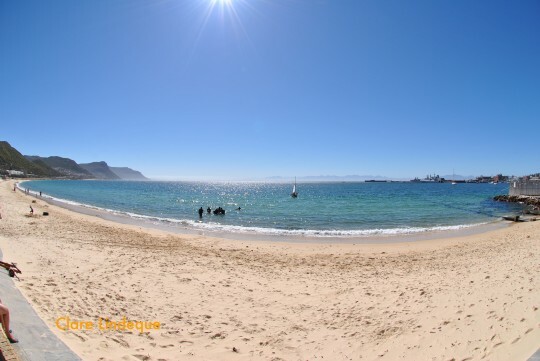 This beach is a popular training site for the dive schools in the greater Cape Town area. If you’re one of Tony’s students, here’s how to get there. There’s a safe parking area, public restrooms, and flat calm waters suitable for swimming, snorkeling, and of course diving! It has a very easy shore entry and the dive site has much to offer. Many a recently qualified diver wants to see no more of Long Beach as they will most likely have done several training dives there for the duration of their course and will feel they have seen it all. This is so far from the truth. 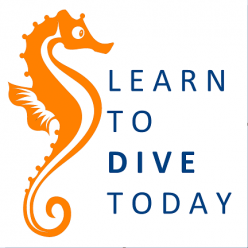 In reality few divers, students or instructors venture far from the beaten track, i.e. down the pipeline, around the wreck, and back to the beach. We built a small artificial reef less than 50 metres from the shore and not too far north of the barge wreck, yet very few people have found it. There is also a wreck approximately 160 metres to the southeast of the slipway, again seldom visited. The list goes on and there is an entire chapter on Wikitravel written by Peter Southwood which if you read this article and follow the routes laid out, it takes you to a whole host of things such as huge anchor chains, a massive anchor, concrete blocks, a pipe structure, several smaller parts of wrecked fishing boats and more. During Open Water dives much of the time is spent on skills and if you do not venture too far off you will have seen but a small area of the dive site. 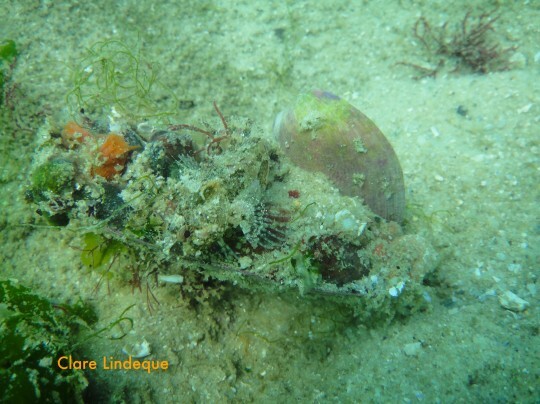 We dive there often, I have done a little over 200 dives there this past year and we seldom fail to see something new. 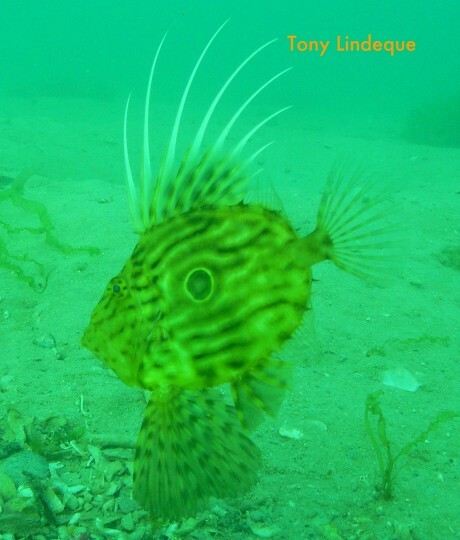 Despite the keen sense we have for exploring , as you become more and more relaxed in the water, you read a few books on ocean creatures, slowly you start to see things you never noticed before. Your sense of awareness increases, your knowledge increases and so does your sightings. 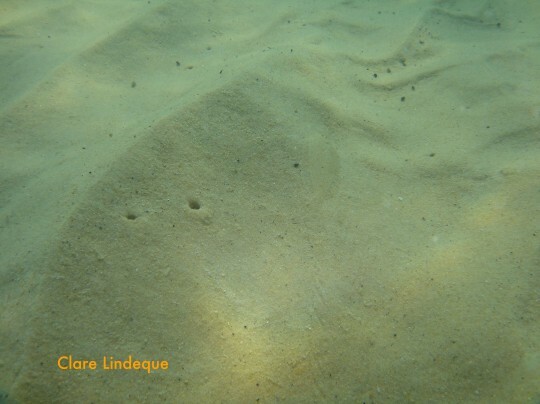 Clare recently discovered a baby Cape sole in the sand (it’s in the picture above in the top right quadrant near the middle of the picture… I promise!). They have been there at this time of year for ages, we have just never seen one but they have been there for sure. Another way to ensure you see a lot more than you expect to is to slow down. The vast majority of Clare’s photos are taken during the long periods she spends hanging around while I perform skills with students. This time spent without finning off into the distance also encourages creatures that hid away when they heard us coming to slowly peek out to see what’s happening, creating some memorable photo opportunities. You will be amazed at what you can see on the sand in shallow water. The life changes with depth and deeper dives will also produce a different spectrum of life as you move down or up through the water column. Long Beach has a lot to offer, but to see something different you must venture a little further than you did during your training dives. You can visit the same dive site every day for a year and something will always be different. Different seasons bring different life to different parts of the ocean all year long.